A properly painted home will look great and will last for many years if properly maintained. While painting is a time-intensive project, the value added to your home can be immense. A great paint job not only requires attention prior to and during the interior and exterior painting process but also well after it is complete. Your expert in all painting jobs is ServiceMaster by Wright. 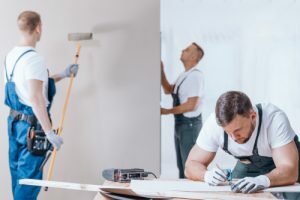 Both interior and exterior painting have a number of enemies that homeowners should be aware of that can damage their appearance and reduce its lifespan. Do you have all the tools needed to paint the exterior of your home? You’ll need the paint, rollers, long handles, drop cloths, and ladders to get started. By the time you buy everything you need, you’d be better off to hire a professional like ServiceMaster by Wright. Besides, what will you do with everything once you’re done painting your home? Professionals will bring their tools, paint your home, and take everything away. This saves you the time and expense of buying everything you need. It also saves you the hassle of storing the tools when you’re done. Professional painters like ServiceMaster by Wright will do a quality job and provide the customer with a warranty and satisfaction guarantee. There are a variety of things that can result in a bad house exterior paint job. For instance, improper surface preparation, using the wrong type of paint, not applying the paint properly or in bad weather conditions, not using enough paint, and so on. If you paint your own home and something goes wrong, you are responsible for the outcome and will most likely need to hire a professional to fix the problem. However, when you have a professional paint your home, they will be the ones who will make the corrections. Whomever you hire to paint your home, make sure their work comes with these guarantees. You can’t buy any paint and expect it to perform well on the exterior of your home. A professional painter will know which brand and type of paint work best for the environment. The material on the outside of your home will also dictate the best paint to use. You cannot use the same generic paint on wood, metal, or brick and expect great results that will last. A pro will know what kind of primer to use. This will help your paint look great on all the different surfaces of your home. Professionals paint trim on a daily basis so they have the skills to get crisp straight lines. They also know how to paint the big areas so they aren’t patchy or blotchy. If your home has a lot of detail work, you’ll want a professional to do this. These intricate designs require the right experience and tools to get the job done right. You need to ensure that you’re protected in the event that there are any damages. Be sure to ask the painting company if they are bonded and insured to protect you from any of these potential incidents. Ask them for copies of up-to-date papers before they begin work that explicitly states that you’re protected. If your home is two stories, then you’ll need to have a ladder or scaffolding to reach the second story. There is a certain amount of risk involved in climbing a ladder to paint your home. This risk increases if the ground around your home slopes. If you have landscaping around your home this presents a challenge to stabilizing your ladder. Professional house painters will perform the job safely since they have the right tools. They also have the training to use the tools in the right manner. Hiring professional painters to paint the exterior and interior of your home will save you time and money. Professionals work neatly and proficiently to get the job done. They bring all of the needed tools and do the prep work. Most importantly, a quality painter for hire will stand behind their work. This gives you someone to turn to for guarantees and warranties. Contact us at 866-676-7761 for faster response or visit https://www.servicemasterrestorations.com/ for more details. Serving businesses and homeowners located in Southwest Florida.